For other uses, see Aldershot (disambiguation). 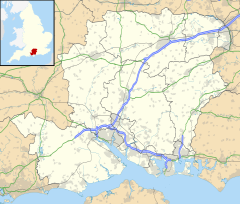 Aldershot (/ˈɔːldərʃɒt/) is a town in the Rushmoor district of Hampshire, England. It lies on heathland in the extreme northeast corner of the county, about 31.8 mi (51.2 km) southwest of London. The area is administered by Rushmoor Borough Council. The town has a population of 36,321, while the Aldershot Urban Area, a loose conurbation (which also includes other towns such as Camberley, Farnborough, and Farnham) has a population of 243,344, making it the thirtieth-largest urban area in the UK. In 1854, at the time of the Crimean War, Aldershot Garrison was established as the first permanent training camp for the British Army. This led to a rapid expansion of Aldershot's population going from 875 in 1851, to in excess of 16,000 by 1861 (including about 9,000 from the military). Mrs Louisa Daniell arrived in the town at this time and set up her Soldier's Home and Institute to cater for the spiritual needs of the soldiers and their families. During this period Holy Trinity church, the Presbyterian church, the Wesleyan church and Rotunda chapel were built in the town centre to cater for the spiritual needs of the increasing numbers of troops in the nearby Camp and the growing civilian town. In August 1856 on her return from the Crimean War and "wishing to be with her sons in the Army" Mary Seacole with her business partner Thomas Day is said to arrived in Aldershot where they opened a canteen, but the venture is said to have failed through lack of funds. The Aldershot riot of July 1945 caused considerable damage to the town centre when disgruntled Canadian troops rioted in the streets for two evenings. In the following year Aldershot's military prison the 'Glasshouse' was burned down in prison riots. The Aldershot Military Tattoo was an annual event dating back to 1894. In the 1920s and 1930s, the Aldershot Command Searchlight Tattoo held at the Rushmoor Arena presented displays from all branches of the services, including performances lit by flame torches. At one time the performances attracted crowds of up to 500,000 people. The Tattoo was organised to raise money for military charities. By the end of the 1930s the event was raising around £40,000 annually. The Tattoo's modern format, the Army Show, was cancelled in 2010 by the Ministry of Defence due to budget cuts. It was briefly revived the following year and attracted 20,000 visitors. In 2012, it was styled as the Aldershot Garrison Show, a smaller free event held on Armed Forces Day. Aldershot Military Town comes under its own military jurisdiction. It was home to the Parachute Regiment from its formation in 1940 until it moved to Colchester Garrison in 2003. Many famous people have been associated with the Military Town, including Charlie Chaplin, who made his first stage appearance in The Canteen theatre aged 5 in 1894, and Winston Churchill, who was based there in the late 19th century during his time in the Army. The area also houses various military and regimental museums, including the Aldershot Military Museum, housed in a red-brick Victorian barracks. Until December 2007 the Parachute Regiment and Airborne Forces Museum was in Aldershot. It has since moved to the Imperial War Museum Duxford. The RAMC Memorial to the 314 men of the Royal Army Medical Corps who lost their lives in the Boer War of 1899-1902 is located at the top of Gun Hill. An outline planning application has been agreed for the redevelopment of some of the former Military Town. The Aldershot Urban Extension will bring some 3,850 new homes, two new primary schools, a children's day-care centre, additional secondary school places, community facilities, waste recycling and landscaping to an area of 150 hectares. In 2013, the MoD announced a £100 million investment to expand Aldershot Garrison and bring 750 more service personnel and their families to settle in Aldershot. The former Wesleyan church on Grosvenor Road has a 100-foot tower that can be seen for miles around the town and which is described as " the only significant tower in the town". Opened in 1877, the church served the Methodists of Aldershot for over 100 years and could seat 1,150 people until its closure in 1988. Today the original complex of church, Soldiers' Home and Hall has been converted into offices, a dental surgery, gymnasium and homes. Aldershot Buddhist Centre is a Buddhist temple and community centre catering for the Buddhists of Aldershot and surrounding area which is billed as the United Kingdom's first Buddhist community centre. With the influx of large numbers of Nepalis into the area in recent years giving Rushmoor the largest Buddhist community in the United Kingdom, a need for a temple and community centre to cater for their spiritual and secular needs was required. The Centre was formally opened on the High Street by the 14th Dalai Lama in June 2015. Farnborough Airport is 5 miles away, Heathrow is 29 miles, and Gatwick is 43 miles away. Aldershot railway station and bus station are both situated off Station Road. From the railway station, South Western Railway run services to London Waterloo, Alton, Guildford and Ascot. Aldershot bus station is the terminus for many bus services in the Aldershot Urban Area; it also services buses from further afield. Bus services from Aldershot are provided by Stagecoach South. National Express coach services operate between London Victoria and Portsmouth twice a day. A mix of infants and juniors, including Park Primary School and St Michael's (C of E). The infant schools are Talavera, Wellington Primary, and Bell Vue Infant School. Junior schools include: Newport County, Talavera, Wellington Secondary and St Joseph's Primary (Catholic). Aldershot has only one secondary school, Alderwood School (formerly Heron Wood School and The Connaught School) though Ash Manor School, Farnham Heath End School, All Hallows Catholic School and The Wavell School are all local. There are also two private schools, Salesian College and Farnborough Hill School in nearby Farnborough. Sam Leach, their then agent, and wanting to become their manager, attempted to introduce the Beatles to London agents by promoting shows at The Palais Ballroom, on the corner of Perowne Street and Queens Road in Aldershot on 9 December 1961. The show was not advertised properly and, as a result, only 18 people attended. The local newspaper, The Aldershot News, failed to publish Leach's advertisement for the show. However, the band and friends had their own fun after the show, including a mock funeral for Paul McCartney. Weeks after this Brian Epstein became the group's manager. At the end of the 1990s and the start of the 2000s, an underground scene of rock bands cropped up around Aldershot. Notable bands include Reuben, Vex Red, Inter and Hundred Reasons. In the 1990s the Victorian shopping arcade and various other period buildings in Wellington Street were demolished to allow for the building of an extension to the Wellington Centre known as The Galleries. The Galleries has remained almost vacant for many years now and is currently under consideration for proposed redevelopment into a mixed use retail and residential scheme, with potential commercial leisure space. In 2003, a health check of the town centre concluded that, "Aldershot is experiencing promising signs of revitalisation, particularly in the shopping core". The Westgate Leisure Park, which opened in 2012–2013 and which fronts onto Barrack Road, includes a Cineworld cinema, a Morrisons supermarket, and several chain restaurants, including Harvester, Nando's, Mimosa, Pizza Express and Frankie & Benny's. There is also a Tesco superstore located at the rear of the development. Aldershot has many parks, playgrounds and open spaces for sport, play and leisure, including Aldershot Park, Brickfields Country Park, the Municipal Gardens, Manor Park and the Princes Gardens, the latter three a short walk from the town centre. The legacy of the Army has meant that the land for leisure use, as well as protected areas for flora and fauna, has been preserved over many years. On the Surrey border can be found Rowhill Nature Reserve which is popular with nature-lovers, walkers and joggers. Aldershot has many sports facilities including the Rushmoor Gymnastics Academy, Aldershot Tennis Centre, Aldershot Bowling, Aldershot Pools and Lido, Aldershot Garrison Sports Centre, Alderwood Leisure Centre (formerly Connaught Leisure Centre) and Alpine Snow Sports (Dry Ski Centre). Formerly the town also hosted short circuit motor racing including speedway and stock car racing. Greyhound racing took place at Aldershot Stadium, and point-to-point racing at Tweseldown. Famous running club AFD has produced top runners. Aldershot is home to arguably the most successful athletics club in British and European history, Aldershot, Farnham & District A.C.. The club has produced many Olympians including Roger Hackney, Zola Budd, Lily Partridge and Steph Twell and specialises in middle–long distance running. The home of AFD, as it is commonly known, is the Aldershot Military Stadium, Aldershot. Blackwater Valley Runners are a social running club and organise many local races. Since 1927, the main football ground in the town, and home of both teams, is the Recreation Ground, also known as "The Rec". It has a capacity for 7,100, of which 2,000 can be seated. Aldershot Cricket Club is based in the town. The club shares facilities with Aldershot & Farnham Hockey Club and the Blackwater Valley Runners running and jogging club. Formerly known as Fleet RUFC, the club started in 1991 as a pub side. The club was renamed Aldershot and Fleet RUFC (A&F) after move in 2003 from Farnborough to their current home Aldershot Park. With an ever-expanding juniors section, Aldershot & Fleet were successful in winning the coveted RFU "Seal of Approval" Club of the Year 2008 for the southern region. The site was the headquarters for the promoter, Spedeworth International ltd. Major national events at the track were few and far between – the most notable title race contested there being the 1975 British Superstox Championship (27 Sep 1975, won by Steve Monk). Now, short-circuit motor sport takes place in Aldershot again, at the Aldershot Raceway, Pegasus Village, Rushmoor Arena Founded and named by local man and ex short circuit racing driver Malcolm Roberts, his wife Gwen and their children in memory of and following the death of their eldest son, also Malcolm, a short circuit motor racing enthusiast. The site is now operated by Spedeworth, whilst the Roberts family relocated to a new circuit in Aldermaston, West Berks, still employing their original operating name of Fleet Motor Club. Rowhill(Rushmoor Borough Council): southwest of the town has three Conservative councillors. Wellington(Rushmoor Borough Council): west of the town together with the northern half of the town centre has three Labour councillors. Manor Park(Rushmoor Borough Council): south of the town and the southern half of the town centre has three Conservative councillors. Aldershot Park(Rushmoor Borough Council): southeast of the town has 2 Labour councillors and 1 Conservative councillor. North Town(Rushmoor Borough Council): northeast of the town has three Labour councillors. St Marks(Rushmoor Borough Council): north of the town and parts of Farnborough has three Conservative councillors. Aldershot North(Hampshire County Council): north west of the town has one Conservative councillor. Aldershot South(Hampshire County Council): south east of the town has one Conservative councillor. As of the May 2018 Rushmoor Borough Council Elections and the May 2017 Hampshire County Council Elections, of the 20 seats on Rushmoor Borough Council and Hampshire County Council covering Aldershot, the Conservatives hold 12 and Labour hold 8. The town is represented in parliament through the Aldershot constituency. The current MP is Leo Docherty (Conservative), with a majority in May 2015 of 14,901 (32.1%). Of the 39 councillors on Rushmoor Borough Council, 18 represent the six wards that cover Aldershot. Of these councillors elected since the last local elections in May 2015, ten are Conservative and eight are Labour. Martin Freeman, actor in The Office , The Hobbit, and Sherlock. Arthur English, actor and comedian, in honour of whom there is now a blue plaque at 22 Lysons Road. Amelle Berrabah, singer, songwriter and former member of the Sugababes. Joel Freeland, professional basketball player, having played for both the Portland Trail Blazers and CSKA Moscow. Dan Middleton, British professional gamer, YouTuber and author. He is best known as DanTDM. The area was used for location filming of the 1970 Doctor Who serial The Ambassadors of Death. The Montgomery Lines were again used for Brad Pitt's film World War Z based on the novel by Max Brooks. Filming began 1 September 2011. ^ "Population Data Sheet". Rushmoor Borough Council. August 2013. Retrieved 2 April 2014. ^ "Great Britain and Northern Ireland". City Population. Retrieved 7 July 2012. ^ a b c "Development of 'the camp at Aldershott'". Archived from the original on 7 November 2009. Retrieved 12 March 2009. ^ "Our twin towns – Rushmoor Borough Council". Rushmoor Borough Council. Retrieved 2 April 2014. ^ Norgate, Jean; Norgate, Martin (2005). "Hampshire maps, Norden 1607, SU95". Geography Department, University of Portsmouth. Retrieved 2 April 2014. ^ Froude, James Anthony; Tulloch, John, eds. (August 1863). "A Chapter on Chalons and Aldershot". Fraser's Magazine for Town and Country. 68. London: J. Fraser. p. 191. Retrieved 2 April 2014. ^ Hamilton, Ernest (1922). Forty Years On. Hodder and Stoughton. pp. 163–164. ^ "Gurkhas win right to settle in UK". BBC News. 21 May 2009. Retrieved 19 May 2012. ^ "Gurkha heroes are 'overwhelming' our town, say Aldershot councillors and MP". Daily Mail. 11 February 2011. Retrieved 19 May 2012. ^ "Gerald Howarth's Nepalese immigration letter in full". Get Hampshire. 14 February 2011. Archived from the original on 7 November 2012. Retrieved 19 May 2012. ^ Ian Drury (19 September 2011). "'Treat the Gurkhas like asylum seekers': Outrage as minister says they should be dispersed around the country". Daily Mail. Retrieved 19 May 2012. ^ "The Aldershot Command Searchlight Tattoos". Aldershot Military Museum. Archived from the original on 8 April 2014. Retrieved 2 April 2014. ^ Pete Castle. "Aldershot army show 2010 to be axed". Get Hampshire. Archived from the original on 12 March 2012. Retrieved 2 April 2014. ^ "Aldershot Garrison Show 2012". Aldershot Garrison. Archived from the original on 13 February 2011. Retrieved 2 April 2014. ^ Pete Bryant (12 July 2013). "First military festival goes off with a bang". Get Hampshire. Archived from the original on 30 October 2013. Retrieved 3 April 2014. ^ "On This Day – 1972: IRA bomb kills six at Aldershot barracks". BBC News. Retrieved 3 April 2014. ^ "Aldershot Barracks: IRA bombing 40th anniversary marked". BBC News. 22 February 2012. Retrieved 3 April 2014. ^ "The Canadian Army Comes To Aldershot". Aldershot Military Museum. Archived from the original on 20 November 2011. Retrieved 2 April 2014. ^ "Aldershot Military Museum. Hampshire Days Out". .hants.gov.uk. 29 April 2013. Retrieved 29 May 2013. ^ "Aldershot receives £100m as part of Germany troop withdrawal". BBC News. 6 March 2013. Retrieved 15 August 2013. ^ "Ecstasy may have caused teenager's nightclub death". The Independent. 29 January 1996. Retrieved 15 August 2013. ^ "The Galleries, key information and delivery approach". Aldershot Town Centre Prospectus Supplementary Planning Document. Rushmoor Borough Council. January 2016. pp. 44–45. ^ "Town Centre Health Checks Cttee report PLN01/63" (PDF). Rushmoor Borough Council. 2003. Archived from the original (PDF) on 27 September 2007. Retrieved 4 September 2006. ^ "Technical Appendix: Percentage of Vacancies and Planning Applications affecting the town centre". Rushmoor Borough Council. 2005. Archived from the original on 15 March 2004. Retrieved 4 September 2006. ^ "Westgate Restaurants". 2013. Archived from the original on 13 September 2014. Retrieved 12 September 2014. ^ "Rise of the Phoenix". BBC Sport. 15 April 2008. Retrieved 15 April 2008. ^ Magowan, Alistair (25 October 2011). "Aldershot 0-3 Man Utd". BBC News Online. BBC. Retrieved 8 August 2014. ^ 1948 Summer Olympics official report. Archived 27 July 2011 at the Wayback Machine pp. 44–47. ^ "Are You Being Served? actor Arthur English honoured with blue plaque". BBC. 15 July 2017. Retrieved 4 March 2018. ^ "Birth records 1837–2006". öfindmypast. Retrieved 3 April 2014. ^ "David Watkin Cinematographer website". Archived from the original on 14 October 2016. Retrieved 14 May 2013. ^ Mulkern, Patrick (28 September 2009). "Doctor Who: The Ambassadors of Death". Radio Times. Retrieved 23 September 2012. Wikimedia Commons has media related to Aldershot.